Viet Nam’s trade as a percentage of gross domestic product (GDP) reached over 200 per cent in 2017, the highest level for any country with over 50 million people in the World Bank’s data set, which goes back to 1960. The information was revealed in a report by the World Economic Forum. 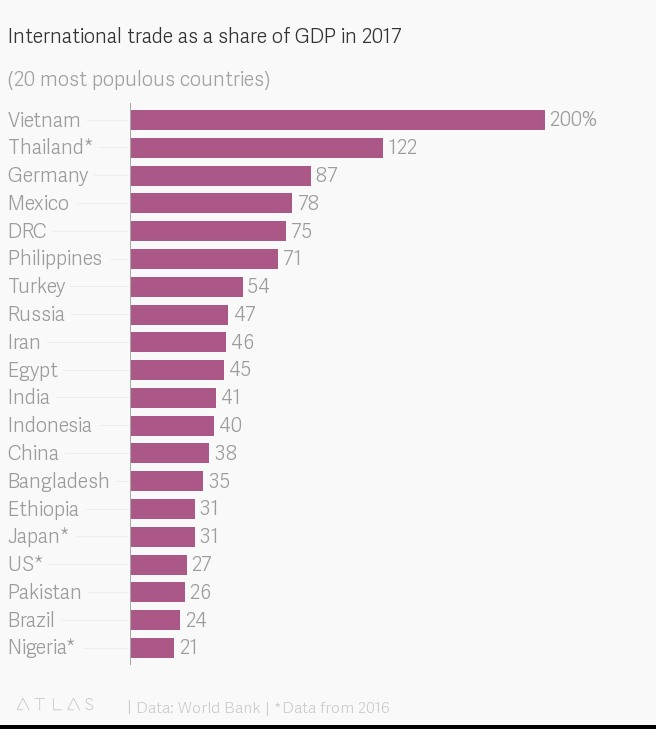 Of the world’s twenty most populous countries, Viet Nam blows away number two Thailand at 122 per cent. The measure is calculated by adding the value of exports and imports then dividing the figure by GDP. Economies with high measures are typically rich and small. Hong Kong, Singapore and Luxembourg all have rates over 300 per cent. Companies in these countries and territories make products for export because the domestic market is too small to consume all of their output. According to the report, Viet Nam’s exceptionally globalised economy is a result of its focus on exports for economic growth. The country opened up its cheap labour market to foreign investors and become a hub for low-cost manufacturing. Globalisation been good for Viet Nam. It’s GDP per capita at purchasing power parity grew from about $1,500 in 1990 to about $6,500 today. Currently, Viet Nam is a major exporter of electronics and apparel, with the United States and China as the main destinations for its goods. Unlike in some fast-growing economies, Viet Nam’s new prosperity has been shared. The proportion of people in extreme poverty fell from above 70 per cent in the early 1990s to around 10 per cent in 2016, the WEF said.